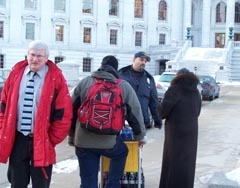 The State Capitol building in Madison has been evacuated, after a bomb threat was called in to Dane County 911. A spokeswoman with the Department of Administration says the Capitol was evacuated shortly after 3:00 pm Tuesday afternoon, as the investigation was underway. Governor Doyle was not in the building at the time the threat was made. Officials say no suspicious objects have been found at this time and the investigation is ongoing.